Casa Álamos Bed & Breakfast has a very special relationship with a Spanish family, who lived in Visalibons and in our house before we became the owners. Early 80´s the family left the village and they settled somewhere else. A number of them ended up in the vineyards and winery branch. They used the gained knowledge and experience to establish their own bodega in the year 2005, which they named “Bodegas Estada”. We met the family in 2011, short before the opening of our B&B. A small scaled but firm cooperation between the old and new inhabitants of the house became a logical fact. Bodegas Estada is the result of many years of experience in the field of cultivation and wine making in the region. The extended knowledge togehter with the perfectly located terrains in the D.O. Somontano region leads to a large series of high quality wines that are affordable, rich in flavors and highly accessible. The word Somontano means "Situated at the foot of the mountains". This little known and relatively small D.O. has an ideal climate for growing grapes where the summer heat combines with the freezing cold of the winters. Bodegas Estada holds a total of 38 hectares in the region on which they cultivate the grape varieties Syrah, Garnacha, Tempranillo, Chardonnay, Cabernet Sauvignon and Merlot. The bodega itself is mostly hidden under the ground. The bodega was named after the little village of Villa de Estada, located near a point were the rivers Ésera and Cinca used to merge. The bodega itself is located in the town of Castillazuelo, in the hearth of the D.O. Somontano region. The labels on the bottles are fragments from the 4th century Roman mosaic "The winning athlete", discovered in the year 1891 nearby Villa de Estada. The mosaic can be seen in the archaeological museum in Zaragoza. It is possible to pay a visit to the bodega, we are happy to make an appointment for you. Unfortunately the owners speak nothing but Spanish. 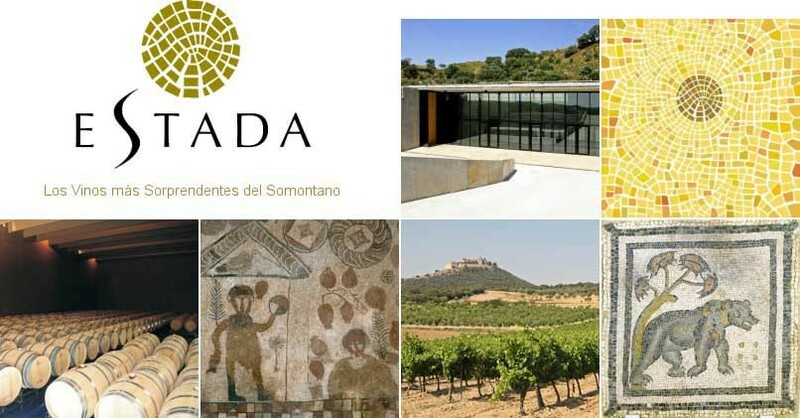 We invite you to visit the bodegas website, in English. The four wines mentioned below are the wines we offer at our dining table and on our terrace. You can also obtain these wines directly from our stock. Upon request it is possible to ship your orders to your home address. The other wines offered by Bodegas Estada, like the GT and Vicious, can also be bought through us. Please contact us for prices and details on shipment and delivery. Once destemmed it is left to macerate cold for 24 hours at 9 degrees Celsius before a static debourbage is carried out. The next step is cold fermentation followed by a final debourbage process and cold stabilisation. Color: cristalline, pale straw-yellow with green reflections. Taste: large and intense display of white fruits and citrus, tasty and full flavoured in the mouth. Grape(s): 70% Syrah, 30% Tempranillo. Once destemmed it is left to macerate cold at 9 degrees Celsius for 14 hours. Then it is drained and the most is maintained cold for 48 hours, carrying out static debourbage. Fermentation at 18 degrees Celsius and final debourbage and stabilisation. Color: cristalline, strawberry-rose color. Taste: clean and intense aromas of red fruits. Very fresh, tasty, fruity and lively. Perfect balance between body and acid components. Grape(s): 30% Tempranillo, 25% Syrah, 25% Cabernet Sauvignon, 20% Garnacha. After destemming grapes are done in steel tanks for fermentation at controlled temperatures between 24 - 28 degrees C. Besides that, the wines are poured and blended to obtain a stable and well balanced product. Ageing process in American or French oak barrels for four months. Color: cherry bright red color with shades of violet on the border. Taste: intens with notes of red berries. Rich in spicy oak and coffee tones. Pleasant finish. Once destemmed it is macerated and brought to 10 degrees Celsius and then left for stabilisation. During the process of fermentation the temperatures never exceed 25 degrees Celsius. Further on in this process the wine receives its rich bouquet. Color: bright cherry-red color. Taste: light and fruity, with a touch of "dry" in the mouth. It´s flavors lasting long.